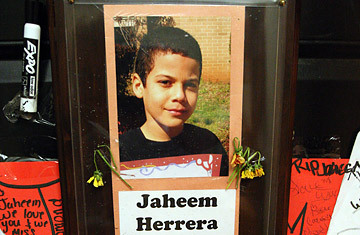 Last month two 11-year-old boys committed suicide within 10 days of each other. The apparent reason: their parents claim that both boys, one in Georgia and the other in Massachusetts, were bullied by classmates who accused them of being "gay." Their families say the boys hanged themselves rather than face another day at school. It's unclear who was told what and when  or whether the schools could have done anything to prevent the deaths. But the cases have highlighted the continuing problem, in an age when children can torment one another via text messages and social-networking sites, of old-fashioned name-calling and physical bullying in school hallways and on playgrounds across the country. The school system released an internal report today that concluded Herrera had not been subjected to more teasing than his peers. At a press conference, retired judge Thelma Wyatt Cummings Moore, who was brought in by the school district to conduct the investigation, pointed to the difficulty Dunaire, like all schools, faces in monitoring bullying. "There is name-calling, there is teasing, but I will tell you that it is almost always done outside the presence of adults," Moore said. "There is a code of silence among the students." Bermudez's lawyer, Gerald Griggs, said today that his client will nevertheless go forward with her intent to sue the school system. He said that Bermudez complained to the school about bullying eight times, but the school system only acknowledged five of those complaints. Each time, Griggs said, Bermudez complained to the principal and to her son's homeroom teacher. "Who did [DeKalb County Schools] talk to in this independent investigation?" he said. Griggs said the National Action Network will stage a protest outside of Herrera's former elementary school on Friday and that the Rev. Al Sharpton is planning to attend a town-hall meeting next week about what happened at Dunaire. Since Herrera's suicide, other parents in DeKalb County have come forward alleging that the school system ignored their children's complaints about bullying. The case has renewed national attention on bullying and how schools define, prevent and respond to it. The federal anti-bullying bill introduced in the House of Representatives on May 5 would require schools receiving funding from the Safe and Drug-Free Schools and Communities Act to implement comprehensive anti-bullying policies that define categories targeted by bullies  among them race, religion and sexual orientation. Another provision would require states to report bullying and harassment data to the Federal Government. Although current laws provide federal support to promote school safety, they do not focus on issues of bullying or harassment.